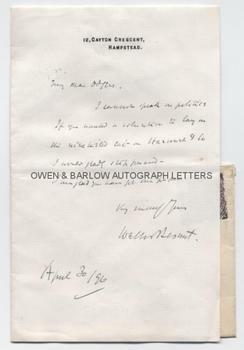 WALTER BESANT Autograph Letter Signed. British (English) novelist and historian. ALS. 1p plus integral blank leaf. Together with original envelope. 18 Gayton Crescent, Hampstead. April 30th 1890. To W[illiam] Blake Odgers. "I cannot speak on politics. If you wanted a volunteer to lay on the nine tailed cat on Harcourt & Co I would gladly step forward. I am glad you have got the paper. Very sincerely yours" [etc]. 8vo. Approx 7 x 4.5 inches. 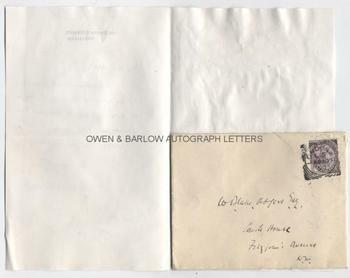 Envelope affixed to the integral blank leaf. Mounting traces to verso of integral blank leaf. All else near fine. Walter Besant was a prolific Victorian author. In addition to his many novels, he also wrote books on history, travel and topography, particularly relating to London. The early fiction of Walter Besant served as the inspiration for Rudyard Kipling to become a writer. His novel 'All Sorts and Conditions of Men' (1880) attempted to draw attention to the conditions of the poor in London and led to the establishment of the People's Palace in the East End. William Blake Odgers (1849-1924) was a lawyer who wrote numerous books on local government, legal practice and the common law of England. 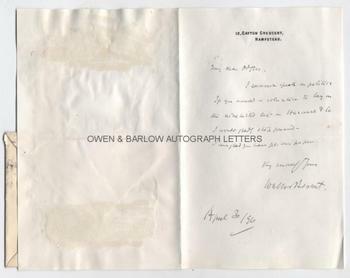 The reference to "Harcourt" in the letter is probably to Sir William Harcourt who had been Home Secretary and subsequently Chancellor of the Exchequer in successive Gladstone governments.